It's definitely soup weather. More often than not in this transitional season, I want to eat soup. It's just so comforting, not to mention, it's warm. So I love finding new ways to prepare soup. This summer, I introduced my family to pho on a family vacation and it was a big hit. So I knew I had some room to add soup that was a little more ethnically diverse into the dinner rotation. 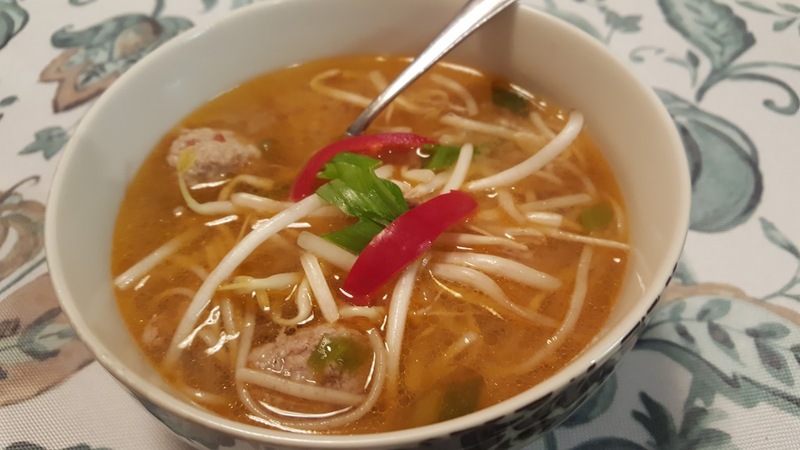 This is not truly pho, but it's pretty similar. You start with a great garlic and ginger base, add miso, and wonderful meatballs that are both spicy and sweet. Throw in some soba noodles and you've got a super delicious meal that's just a little different, but not "too" different, if you know what I mean. You can make this more spicy by throwing in the jalapeno pepper earlier in the process. My family prefers things a little more tame, so those that wanted to used the pepper as a garnish. Find more great ideas at Inspiration Monday, Mix it Up, Busy Monday, Inspire Me, Inspire Me 2, Create Link Inspire, Fabulous, Hearth and Soul, Wow Me, Wow Us, Full Plate, Wonderful Wednesday, Foodie Friday, Weekend Potluck, Awesome Friday. Heat oil in a Dutch oven over medium heat. Add 3/4 cup green onions, garlic, and ginger; sauté 6 minutes. Add stock; bring to a simmer. Reduce heat to medium-low; cook 8 minutes. Meanwhile, cook noodles separately according to package directions; drain. Rinse with cold water; drain. Combine honey, sambal oelek, soy sauce and ground pork in a small bowl. Shape pork mixture into small meatballs. Remove ginger slices from stock mixture; discard. Stir miso into stock mixture and whisk well. Add meatballs to stock; cook 6 minutes or until done. Add noodles. Ladle soup into bowls (I needed to use a fork to get the noodles!) and sprinkle with remaining green onions, mung bean sprouts, and jalapeno chile. 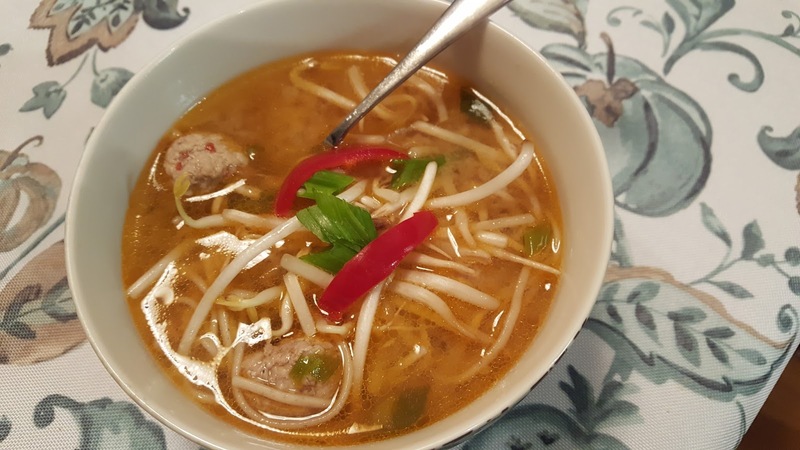 Your Miso Meatball and Noodle Soup will be delicious! Your post is awesome and thanks so much for sharing it with us at Full Plate Thursday. Hope you have a great week and come back to see us real soon! I really like this recipe, Sara! Your soup is fusion cooking at its best and definitely comfort food. Thank you for sharing, and for being a part of Hearth and Soul. Hope to see you at the party again this week! Have a lovely week ahead!